Why Should Scotland Have More National Parks? Scotland’s landscapes rank amongst the best in the world in their richness, quality and diversity. We have wild mountains, pristine rivers and lochs, ancient forests and stunning coastline and islands, all rich in wildlife and history. Our landscapes enhance our quality of life and our well-being. They give us inspiration, refreshment and enjoyment. They provide great opportunities for outdoor recreation, including walking, cycling, canoeing and mountaineering. They are one of the main reasons why people visit Scotland, so they support important economic benefits through tourism, our largest industry. With landscapes of such quality you might expect Scotland to have several National Parks – the principal tool used across the world to safeguard and manage fine landscapes. Although the world has over 3,500 National Parks (including for example 60 in Canada, 29 in Norway and 14 in New Zealand), Scotland has only two, both quite recent. 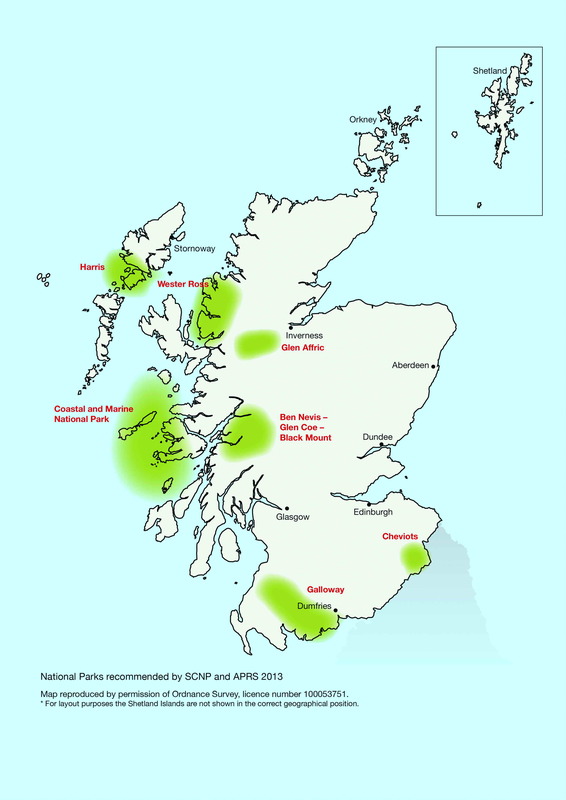 SCNP and APRS have campaigned for National Parks for over 60 years, and four out of the five parties in the Scottish Parliament currently support more National Parks. Our Unfinished Business report (2013) summarises the benefits National Park status brings, and proposes seven further National Parks. Local people from several of these areas, including from the Cheviots, Galloway and Mull, have set up their own campaigns for a National Park for their area and have contacted us for support. Our proposals are backed by the John Muir Trust, Mountaineering Scotland, the National Trust for Scotland, RSPB Scotland, Ramblers Scotland, the Scottish Wild Land Group and Woodland Trust Scotland. Click on map for a larger version. ‘National Park’ is the leading internationally-recognised designation for places of the highest national importance for natural or cultural heritage, including landscape, wildlife and recreation. Many Parks are truly wild; others, as in Scotland, are wholly or partly inhabited, working landscapes. They stand proudly alongside world-renowned places such as Jotunheimen in Norway, Kilimanjaro in Tanzania, the Galapagos Islands in Ecuador, Cradle Mountain in Tasmania, the Karakoram in Pakistan and Yosemite in the USA. What Benefits do National Parks Bring to Scotland? National Parks bring many environmental, social and economic benefits to local residents, to visitors and to Scotland as a whole. They provide a clear focus on a particular place, mechanisms to stimulate and co-ordinate positive conservation management, and additional resources to reflect its importance to the nation. They benefit from an agreed plan designed to safeguard the area’s special qualities for future generations whilst managing tourism, transport, energy, agriculture, forestry and fishing in integrated and positive ways. They can inspire pride and passion amongst local people and visitors. The Scottish Government provides national funding to sustain the communities in and around National Parks, encouraging jobs which support and look after these special places and their ways of life. The Parks bring visitors to remote areas, benefit tourism and other land-use interests, and generate new commercial and marketing opportunities. National Parks supplement and add value to existing designations rather than duplicate or replace them. The designation is permanent; where other arrangements may come and go, National Parks are rarely abolished. Our Socio-economic Benefits report (2015) and our Tourism report (2016) argue that creating more National Parks could provide major economic boosts to several fragile rural areas in Scotland. They point to the success of rural areas in other countries such as New Zealand and Norway, where National Parks have played a major role in stemming rural depopulation and providing a range of job opportunities. Given this wide range of benefits, the two existing National Parks represent remarkable value for money at a combined cost about £14m per annum. Our Governance Models report (2015) sets out why most of our proposed National Parks would cost even less than this, as they would cover smaller areas and would require less complex management and staff structures. If you would like to support our campaign for more National Parks, please join SCNP or APRS and email or write to your MSPs to let them know your views. 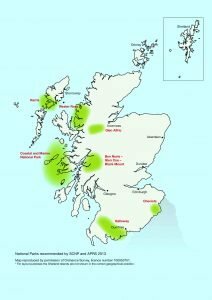 Policy on National Parks in Scotland has developed over many years through a series of reports by a range of government agencies and non-government organisations. Here is a selection of the most significant of these reports for anyone interested in the historical development of thinking on this subject.